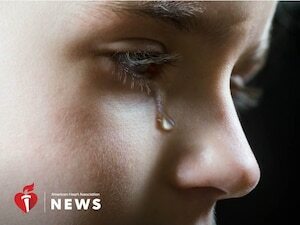 THURSDAY, Nov. 8, 2018 (American Heart Association) — Children who grow up in distressing or traumatic environments are more likely to have a heart attack or stroke by the time they reach middle age, according to a new study. “What we found was that people who are exposed to the highest levels of childhood family environment adversity are at significantly increased risk for heart disease like heart attack and stroke,” said Jacob Pierce, the study’s lead author and a medical student who is studying for a master’s degree in public health at Northwestern University in Illinois. The findings will be presented Saturday at the American Heart Association’s Scientific Sessions meeting in Chicago. “People exposed to the highest levels of childhood family environment adversity were more than 50 percent more likely to have a cardiovascular disease event during the 30-year follow-up period,” Pierce said. The researchers haven’t pinpointed the reason for the connection, although they have several theories. That combination of mental, physical, social and behavioral factors could be interrelated, said Shakira Suglia, an associate professor of epidemiology at Emory University’s Rollins School of Public Health in Atlanta. “All those factors could be part of the pathways by which all these bad experiences in childhood have an impact on cardiovascular health,” said Suglia, who was not connected with the study. Traumatic childhood environments also have been associated with poor eating habits, more sedentary lifestyle, rapid weight gain and sleep disturbances. “It’s possible that through a health behavior mechanism, you become more likely to have obesity, hypertension and diabetes in adolescence or early adulthood and then in late adulthood, you end up having these cardiovascular events,” she said. “To really tackle this entire problem, it’s going to need a comprehensive intervention between public policy, social programming, as well as clinical interventions for adults at young ages,” he said.